The Embryo Chair was designed in 1988 by Australian designer Marc Newson, and has come to be seen as a signature object of his organic style. The chair is not only stylish and provocative in appearance, its one-piece form and simple legs belie a sophisticated construction that is the result of Newson’s technical accomplishment early in his career. While the three legs appear to be precariously balanced, they are actually part of an internal welded aluminum frame that supports the body of the chair. The body itself is a single piece of injection-molded polyurethane foam, and is covered in a neoprene fabric that is more closely associated with wetsuits. 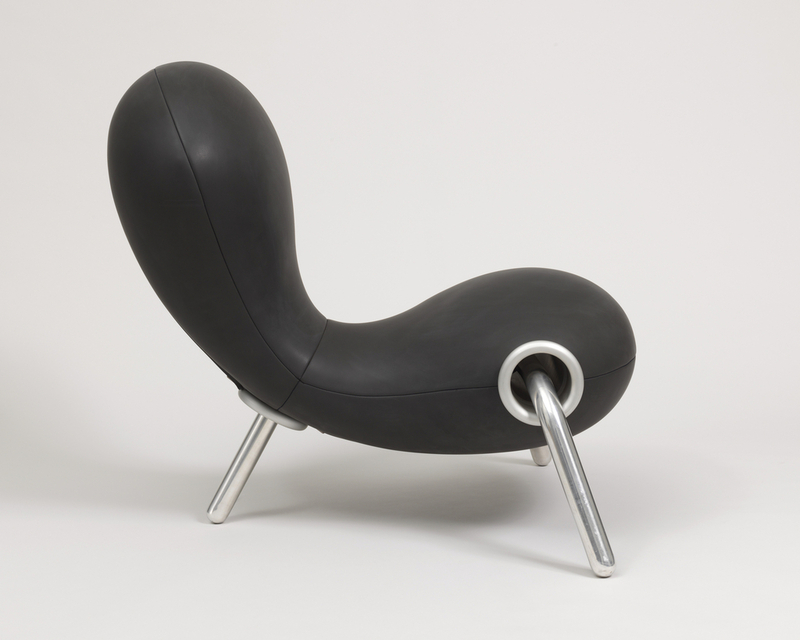 The slick, smooth texture and vivid color palette of neoprene struck Newson as being, “very Australian.” Yet for all of the Embryo Chair’s unique qualities, its contoured, swelling shape suggests a familiarity with the human form, and extends an invitation to rest comfortably in its body-hugging embrace. The Embryo Chair in some ways harkens back to the organic shapes of chairs developed by Verner Panton and Arne Jacobsen in the 1950s, but through its unique shape and materials, manages to create its own identity, and the distinct impression that it is a product of the last years of the twentieth century. Bill Shaffer is a graduate student in the History of Design and Curatorial Studies program jointly conducted by The New School/Parsons and The Cooper Hewitt Museum. The Embryo Chair is on display in Energizing the Everyday: Gifts from the George R. Kravis II Collection, on view from April 27, 2016 through March 12, 2017. In relation to wallpaper design, one might also venture into the work of Clement Meadmore, the sculptor-designer (who also wrote “The Modern Chair”, a book reprinted by Dover Books). Meadmore’s mammoth bronze sculptures were designed using dimensional modules, akin to repetitive patterning. The line between Fine Art and Design blurs.